The beauty of a how-to book is not just that it teaches you what you know nothing about, but also that it nudges you back toward something you have known about but never tried. 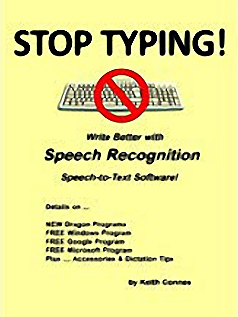 STOP TYPING! : Write Better with Speech Recognition Speech-to-Text Software! by Keith Connes. $.99 (or free with Kindle Unlimited via Amazon). Had I read this book six months ago, it would’ve saved me at least six hours of labor. I was writing an article that initially involved recording a phone conversation. I then had to transcribe that conversation with my nimble fingertips. Had I known more about Dragon NaturallySpeaking software, I would have not spent so much time transcribing. Here are a few of the notable achievements of this book. Shopping tips. For example, he recommends a portable digital recorder from Sony’s ICD-PX series. In the misty past, I once used a microcassette player but found it inadequate for transcription, even when used with Dragon NaturallySpeaking. Unhappily for me, in the last few years I have been neglecting the current crop of digital recorders. I have been vastly ignorant of their mighty powers. They actually allow Dragon NaturallySpeaking to transcribe with far more accuracy than Ann Southern in Private Secretary (1953). This tip would’ve saved me a great deal of trouble. Transcribing tips. Connes suggests that if you are trying to transcribe a poor quality recording, like the aforementioned phone conversation, you should “parrot” it into your digital recorder. Parroting means that you repeat the words of the poor recording after you hear it, using a good digital recorder to obtain a suitable transcription of it. Product reviews. The author goes on to evaluate four programs, three of which are free and one that costs money, and advises you of the pluses and minuses of each. No surprise, the one that costs money, Dragon NaturallySpeaking, is the best at voice recognition. The others are only fair at interpreting short notes to yourself, for example. But they are exasperating because they make frequent errors. Be aware that speech programs like Dragon aren’t the total solution. You will still have to type to clean up where it fails you. In our modern times, however, this doesn’t need to happen as frequently as it used to. Caution: You might try to outfox Dragon by entering “period” as a new word in the program’s vocabulary, in which case you’ll likely lose “period” as a punctuation command. The workaround to that workaround is to say “full stop” instead of “period” at the end of your sentences. If you write something without typing it, you feel like you’ve gotten away with something. And in a way you have. For example, you’ve gotten away with unstrained wrists, a boon particularly for those who are of a certain age. You’ve also gotten away with that bad case of neck strain you always used to get while at the computer. Not so fast on this one, however. You will still have to edit your work. But it will be a lot easier because programs like Dragon have editing features you can enlist to move up and down your computer screen as if by magic. Once you are completely sold on this idea (the main part of which is being fearless about whipping out your portable recorder in a crowded restaurant), you can establish a workflow that’s best for you. One that gets rid of those pads of paper you carry with you to jot down notes. One that stops you from flipping open your cell phone and trying to use its note feature. Basically, this is a workflow that makes you a more efficient writer. Connes proceeds to recommend the best equipment: for example, transcription microphones such as the ones he has. He then gets into detail about serious types of Dragon software. He also recommends Scott Baker’s free book Quick Cheats for Writing with Dragon. This book came with some admonitions of its own, one of them being that Dragon can crash and erase the text that you have so tediously entered. He advises using a third-party program that can accept Dragon’s commands like WordPad, which won’t crash when it does. One of Connes’ visual images sticks in my mind. It is a scene that he says portable dictation could offer you. Speech recognition not only makes my writing easier, but I've become far more productive. For example, the words you are reading right now were originally spoken into my little digital recorder as I reclined comfortably in an easy chair looking out on a beautiful lake that borders on my property. Such will be my workflow from now on.